Over the past few weeks I have been researching an on the rise interiors trend for dark wall colours in our homes. As a nation of renters afraid to step outside of the magnolia/neutrals of our surroundings, it excites me to think of using this interiors idea for the Belgravia living room project I have been working on. I really love the idea of carefully selecting a wall colour to create a little dark cocoon. To create a comfy, warm sense of safety and security. After all, one can always paint over a wall if one grows tired & fancies a change! All at a price cheaper than replacing a bed, couch or kitchen unit. Take a look at my favourite dark interiors and see what you make of my plans for Belgravia Living Room 2017. Milano Solferino Project by Dimore Studio. 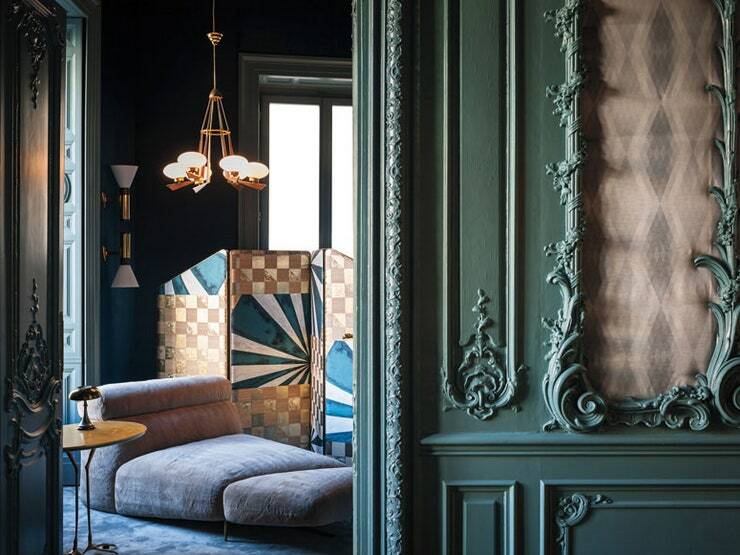 I have been obsessed with this Milanese design duo since I came across them on madaboutthehouse.com (lovers of grey and dark, dramatic interiors take note) They combine rich texture and colour but also a faded kind of glamour. Employing velvets and deep colour with pops of bright colour and pattern, the pair evoke a '70's charm without being garish or over-the-top. Their choice of beautiful metallic finishings and accessories evoke a laid back, eclectic luxuriousness that seems to feel found rather than too try-hard or "bling-y". In terms of wall colour, they seem to use this stunning blue/grey/green across a few projects. Warm yet not saccharine, this colour would take both cold and yellow light (read on for tips on how to choose colour for the direction of a room), and would be perfect for the Belgravia apartments west facing aspect. Note the grubby gold I have an ongoing passion for! And her Bowery Blue is certainly one I shall be trying in the Belgravia project. This colour is just the right side of green that will sing against the existing furniture and accessories in the making. And so, finally to what I have learned this week about wall colours. One cannot be told this enough: light is important when trying out wall colour. I learned a lot from this post by Farrow & Ball about the light direction in a building that should help you too. The Belgravia apartment is west facing, which means that the light is cooler in the morning and warmer in the evening. The room doesn't get much light, except at oblique angles. It is built facing an adjacent apartment block. At night the light comes from the warm bulbs of the Chelsea Bridge & artificial light from bulbs as the space is used mainly evenings and weekends. Quite a dark navy could work as the warmer yellow ones may turn the blue a deep, dark teal, working with the racing green of the Chesterfield sofa and the teal midcentury sideboard. There is only one way to find out however; we must do colour tests! Check Instagram on Sunday for a look at how the space is looking at the moment and how the selected colours do in the west light! See more ideas for this dark wall colour project on this Pinterest board. Anything I've missed out or that you are excited about trying? I'd love to hear what you think in the comments below! At the start of 2017, I started working on redecorating the living room of a new build apartment in Belgravia. The apartment is in a new build estate with one bedroom, and the chosen room we are starting with is the living room. This is a long, narrow space which is open to the kitchen and features full length windows and a Juliet balcony. The client wants to separate the living space from the kitchen area a little more and make it more of a distinct space for relaxing and entertaining. Not a huge amount has been done to the space since moving in; the floor has been changed to a dark wood but the walls still feature the vanilla cream of the original design. As you can see from the mood board above, I am planning on keeping the eclecticism going but drawing all the elements together with a dark, moody wall colour and select pieces of midcentury furniture (which will also provide much needed storage space). I want to introduce a darker wall colour to make the space more personal and cosy. Not much natural light gets into the space because of the aspect of the building, but this can be tackled with well placed mirrors. The trend towards tropical continues to dominate interiors and homewares in 2017, so take a look at different ways to use this vibrant and uplifting style in your own home. Shade loving plants will grow happily in the living room as the apartment is very warm (a side effect of the building being, for some inexplicable reason, clad in metal), which will bring vitality and texture to the room, not to mention oxygen and a sense of wellbeing. Finally, introducing a gallery wall can break up the solid colour, as seen above in this glorious composition by Dabito on oldbrandnew.com. Touches of grubby gold (again, my love for dark neutrals and pops of fresh colour is ongoing), & cobalt or teal blue. I may even be able to sneak some blush pink in too (shhh) through accessories. I've been toying with the idea of introducing some fun printed textiles to tie all the colour selections and eclecticism together. This could be in the form of drapes, scatter cushions or even a throw in a loose geometric, expressive pattern design. Potential colour palette for the living room decoration. So all of this adds up to lots to be getting on with! The first step has been to install a lovely teal blue midcentury sideboard, already providing the space with much needed storage space and colour. I'm continuing to look for a great room divider: G-Plan or midcentury in style, which will again provide storage without blocking the natural light to the kitchen area. Stay tuned for some before photos, plus work in progress reports! See more ideas for this redecoration project on this Pinterest board. Anything I've missed out or that you are excited about trying? I'd love to hear what you think in the comments below!